Trains were always an exciting event for me—my grandmother liked to count the cars as they ran past and one time she decided she needed to know exactly how fast it was going. She buckled her seat belt–in those days you had to ask for them, and then drove along the road to Lacrosse Wisconsin trying to stay even. That river road is not exactly very straight and occasionally there are farm vehicles or snowplows. I think she clocked it at 80 mph—a dizzingly fast speed for someone who had experienced horse and buggy. Now I live near a switching yard and can hear the cars bumping at 5 in the morning. But then there’s the stopping and going at a snail’s pace over all the intersections or blowing the horn loud enough to be heard many blocks away all night long. 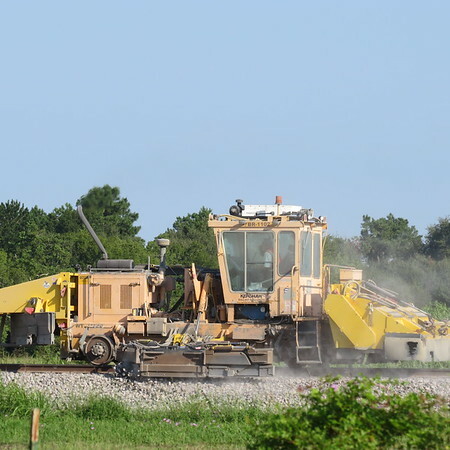 However, I am still intrigued by the mechanics of maintaining those tracks—today I spied two large flat bed trucks with cranes attached and piles of railroad ties, new ones—and then here is the grader that smooths the gravel so those ties can fit snugly and evenly.